Oh my goodness. The words that come to mind! Lavish, Lovely, Luscious – Di van Niekerk and Marina Zherdeva’s new silk ribbon embroidery book, Little Flowers in Silk & Organza Ribbon is all of the above! 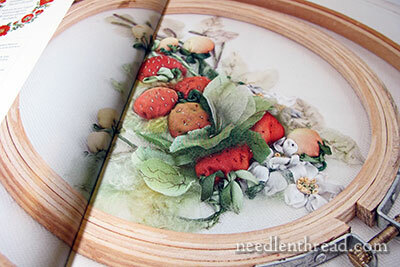 For silk ribbon embroidery enthusiasts, I’m pretty certain all of Di’s books are a must for your bookshelves. 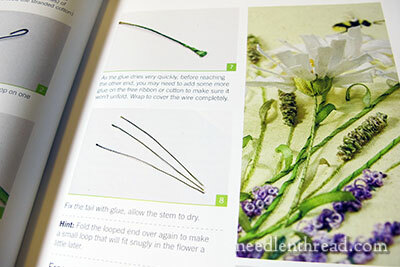 But silk ribbon embroidery – and the techniques found in this book that I’m reviewing today – goes beyond just the SRE enthusiast. If you are a crazy quilter, if you love stumpwork and three-dimensional embroidery techniques, if you are a flower enthusiast, if you just like pretty things – this book will draw you in and teach you much! First off, like all of Di’s books, this one is a beauty. 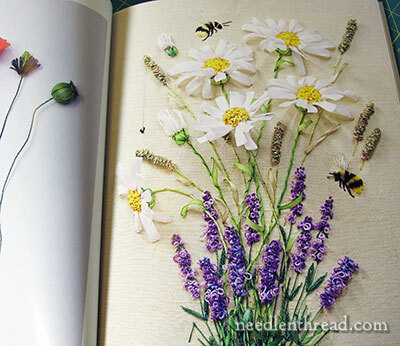 It’s one of those books you can leave out on your coffee table, that people who aren’t remotely interested in embroidery will browse through and take delight in. The photos, the colors, the abundance – the book is mesmerizing! But the great thing is that Di & Marina combine a gloriously beautiful book with solid instruction. That’s a win-win combination for me. I love to look at books, but even more so, I love to read them and learn from them. 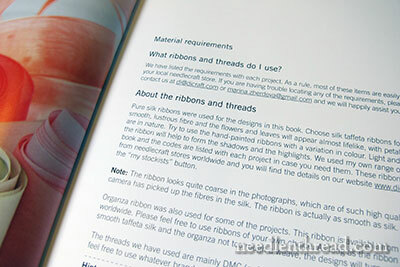 The first part of the book is devoted to the basics, including the materials you’ll need for silk & organza ribbon embroidery. Di covers all the tools and equipment, the types of fabric, needles, ribbons (and where to find them) – everything you need to get started, with clear tips and resource information. For adventuring forth in this type of silk ribbon embroidery, you’ll find some items on the list that are a little different from your typical hand embroidery excursion. For example, a glue stick! 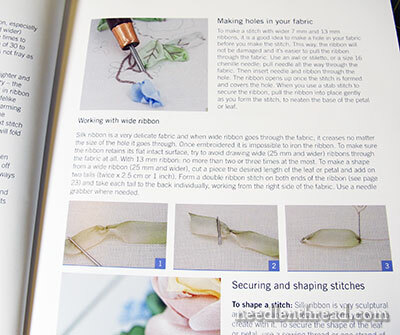 After covering all the needful supplies, the authors go on to explain the basics of silk ribbon embroidery, and this is all done with clear text and precise, step-by-step photos. So even though the projects in this book look elaborate and advanced, I think the newbie to silk ribbon embroidery can definitely venture in, too. All the basics are covered, so if you’re just starting out, you’ll have the foundation information you need to approach the projects in the book. 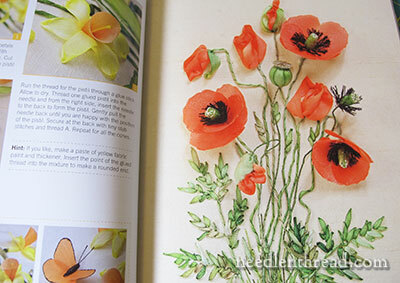 They also cover techniques that are a little different, when compared to most silk ribbon embroidery instructional books. 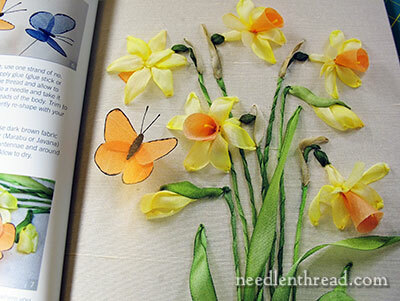 They show you how to use wires effectively (great tips here for stumpwork embroiderers, too! 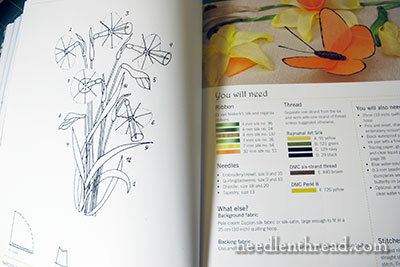 ), how to make seed pods, how to measure things and make butterfly wings. Lots of neat little tricks, all mapped out step-by-step. And then…the projects! They’re all flowers – narcissus, poppies, chamomiles, a rose wreath, strawberry blossoms, a ring of daisies, double roses and blue violets, wild roses and pink blossoms! Each project begins with a full, up close, colored photo of the finished design, gorgeously executed. We’re given a line drawing for the design transfer and a thorough materials list. And then, we’re taken step-by-step through the entire project with photos and text, so that we can re-create the design with confidence. It’s pretty much as close as you can get to having the teacher with you, without having the teacher with you! The projects begin from the beginning – from the set up of the whole project – and take you all the way to the finishing. …until I saw the chamomile. Each project is more beautiful than the one before, but I am partial to the chamomile. I’ve put it on my List. 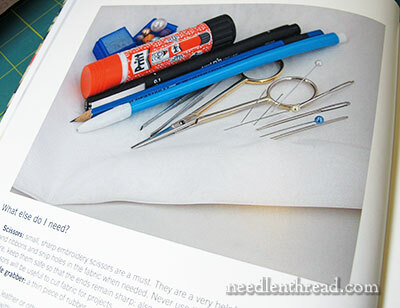 The book ends with a stitch dictionary devoted to the various ribbon embroidery (and regular embroidery) stitches that you’ll use in the projects. And there it is, my friends – another glorious book from Di van Niekerk! 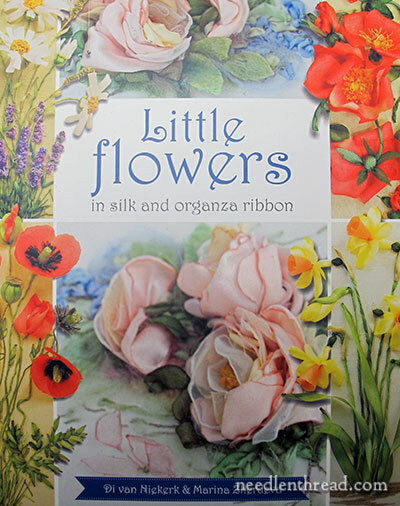 In the US, Little Flowers in Silk & Organza Ribbon is available here through Amazon. Worldwide with free shipping, you’ll find Little Flowers through Book Depository. I really like silk ribbon embroidery and the photos above are just beautiful. it’s hard to chose my favourite from the photos above because they are all so lovely. I particularly like the the step by step stitch directory that is always so helpful when you are starting a new approach to embroidery. But the overall book looks very informative and instructional that it is definitely going on my wish list. Thanks for sharing such a beautiful book with us. As a French speaker, i understand English pretty well, but I do not always what abbreviations stand for. Could you please tell me what SRE means. Silk Ribbon Embroidery – sorry about that! How do you frame pieces like this, or don’t you? I’d hate to put work into something like that and worry about it getting dusty. A big box frame, I guess? Stunning ! 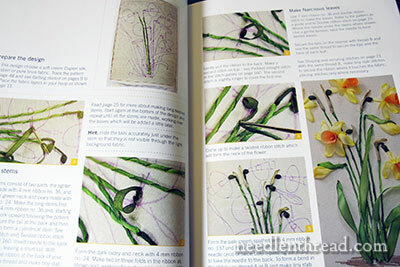 Always look forward to the new embroidery ideas and books you share with us ! Ribbon embroidery another fun thing to look forward to learning. Stumpwork still gets my full attention when I see it. Always happy when you show stumpwork too! Appreciate the time you spend in managing your website! Very easy to navigate through!! Thx Mary! 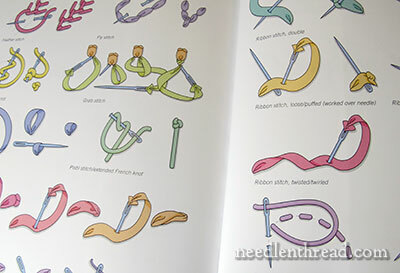 I never realized ribbon embroidery and I don’t know if it is “easy”,I have many problems with English, but this new book is very beautiful. Thank you for the beautiful picture and thank you for easy sprint for monograms. Thank you for reviewing Di’s Little Flowers book. I haven’t bought this one yet but I’d like to say that having bought Part 1 of the embroidery and stumpwork kit for her RES (Ribbon Embroidery and Stumpwork)directly from her I can attest to her fantastic customer service and helpful attitude. She and Renn (who is her sister-in-law) are both just about the loveliest people ever. I also own the RES video part 1 and the RES book. Everything is very helpful and as a newbie embroiderer and stumpworker I find her instructions easy to follow. Her handpainted ribbons are to die for as well. Just in closing – the only thing I haven’t been able to find in the US for stumpwork is the water based anti-fray liquid. Di sells it on her site, so that is a must to order from her while you’re ordering anyway. Shipping is quick to the US from South Africa. Drat! I just got one of the books from my wish list (today) and was congratulating myself and now I’m going to be adding this one onto that list. I’m never going to get it whittled down if you keep reviewing such tempting books!! I recently had my computer develop some type of glitch and have lost my download of “Lavender, Honey and Other Little Things. Is it still possible to download it again? I hope I’m within the time limit. Please advise. Just re-sent the file to you, Mary! I have seen this book on Di’s blog and resisted, get thee behind me, Satan and so on. But you, Mary, you have caused all sorts of troubles and tribulations with this splendiferous review. Of course I had to buy the book. And now I will have to justify said purchase – not to the Chancellor of the Exchequer, he says if I need a book even if it is only to look at the pictures then it’s OK with him, but with my own sense of the ridiculous. I am never going to make such gorgeous creations as these, but oh, they are gorgeous, aren’t they? And isn’t that justification enough for anybody? I just bought this book in May after taking a Royal School of Needlework Ribbonwork Day Class in San Francisco with Sophie Long. The embroidery shop there Forever Embroidery Studio was selling it along with many other stunning books. Sophie was an amazing tutor and has been working with larger ribbons too. The book and class was very inspirational. It seems to be a wonderful book and good to learn about it in your article. tHIS BOOK IS FULL OF BEAUTIFUL PROJECTS. tHE INSTRUCTIONs APPEAR TO BE EASY TO FOLLOW,detailed for SOMEONE THAT IS NEW. i AM BUILDING MY LIBRARY AND AM INTERESTED IN EXPANDING MY SKILL . What a beautiful book !!!!!!!! Eu quero comprar os livros. Gostaria de saber se tem as instruções para terminar o avesso e vê-loo. Is this book good for a beginner? I wouldn’t make it your first silk ribbon embroidery book. 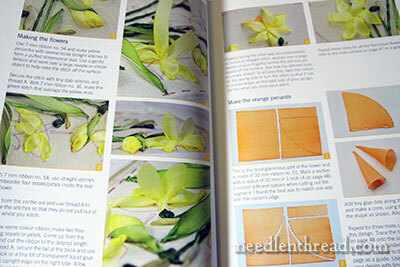 If you haven’t done silk ribbon embroidery before, you might start with a book specifically for beginners. But then, of course, it all depends on how determined you are to accomplish the ideas in the book!